Not quite as warm, or swarmed out as it was yesterday but still a busy day on the trains and in particular in the buffet too. 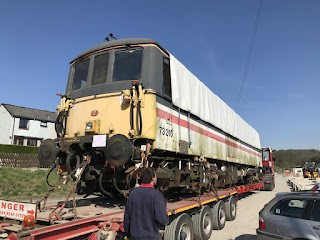 Down the yard, coach restoration continued and the Derby Lightweight trailer car temporarily entered the maintenance facility for roof leak repairs. Another beautiful sunny day, perfect for a Driver Experience. Today's participants were lucky enough to take Iris for a spin this morning, followed by the gleaming Class 33. All participants thoroughly enjoyed their day. Down the yard, the Met Camm green two car had a few odd jobs done including replacing a seal on a vacuum valve which had started leaking and a new start button on 50253's No2 engine. Work continued on the Derby Lightweight restoration in the shed. A scorching hot day for once! Weird to think that two weeks ago it was snowing! Today, the main thrust was down in the shed where the S&T had a little shunt so that they could pull out their newly constructed bracket signal. We welcomed the arrival of 73210. 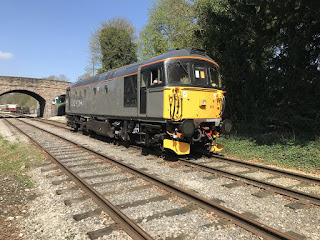 These versatile and economical electro-diesels are ideal for preserved railways as the 600 hp diesel engine can trip work and haul trains cheaply and at line speed. The locomotive needs some work to return it to service but not too much in the grand scheme of things. A dry and mild day saw reasonable loadings on the train for the time of year. We also hosted a small hen party who enjoyed a buffet meal followed by a train ride. There weren't many people down the yard today, with only a pair working on the coaches. A lone member beavered away on the Class 119 which is under exam. Quite quiet really in the engineerium!